One of the finer aspects to living down the street from my parents is being able to walk from home-to-home with the greatest of ease. Just last night I headed out to an informal Jazz play-off party as the sun was setting. Spring looked lovely. Walking up the street, I was contacted by a senior citizen who introduced himself as Brother True. I likewise presented myself as Sister K and remarked on how nice it was to meet him. It has been recorded in this blog (many times) that I feel a general uncomfortableness around the senior citizen crowd in a way that some people feel about small children. Brother True was so friendly, albeit he had something yellow and crusty on his face that made me a bit sick to see. I continued on up the street, but Brother True (all "Ninety-one years that is what!") followed me asking more personal questions and the exactness of my origins. My origins are here. I explained. In this very neighborhood to be sure. Once my genealogy was discovered I was ushered into Brother True's house to meet his wife, Leona. She was asked to guess whose daughter I was, and though she hadn't a clue by looking at my face, the game continued on until I finally uncovered the truth. I am the daughter of The State Representative and The Councilwoman. My father's family were some of the first to build in the area and raised subsequent generations of offspring in the surrounding houses. "Your dad is the neatest guy around!" Brother True said jumping up and down so that the glasses on his faced slid to his nose. "Oh your mother has done such wonderful things for this neighborhood!" Leona followed-up. "I taught your father in scouts. He caught seventy-two fish one time on an outing to the Uintahs!" Brother True snapped his fingers. Then there was talk of my grandmother's husbands who also lived in the neighborhood. Don, my father's father who died in a plane crash in remote Nevada. Earl, her third husband who had a bygone carnival in his backyard, including a rusted-out ferris wheel. And Don II, her current husband with whom she shares a passion for rose gardening and late-summer dahlias. "Your grandmother is one hundred percent!" "One hundred percent?" I asked. It was the first time I had heard a percentage used as an adjective. But Brother True had turned around, headed back to Leona for a night with The Ensign. As I continued to round the corner I thought about the whole exchange. I thought about my Provo ancestors building a new neighborhood. I thought about my offspring who--Chup desiring--might be raised on the same lazy-driven streets as I did. Most of all I thought, It's true what they sang on Cheers, it is nice to be where everybody knows your name. Maybe not one hundred percent of the time, but . . . kinda nice just the same. 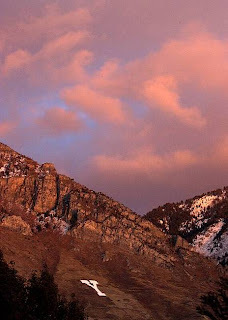 *Y Mountain photo from BYU news.